The Present Room is a special room accessible in Mario Party 4. The player can view presents gained from completing one of the six boards in the game's Story Mode. The presents would be awarded by defeating the hosts in a minigame. The Present Room consists of nine miniature rooms. Each room except the minigame room belongs to a playable character. Presents in the Minigame Room can be obtained by meeting requirements in certain minigames. The presents obtained differ by room. 2 The "Very Final Surprise"
Mario's Doll: This is a Mario doll. He's everyone's favorite hero. Even Luigi's! Mario's Refrigerator: This is Mario's refrigerator. There's always leftover pasta inside. Mario's Sofa: This is Mario's sofa. He folds it out into a bed when guests come. Mario's Table: This is Mario's table. It's very cute and round, just like Mario! Mario's Television: This is Mario's television. It rarely works, but he rarely uses it! Bowser's Vase: This is a Bowser vase. Flowers always seem to wilt the moment they go in. Mario Doll – Earned by completing Koopa's Seaside Soiree with Mario. Mario's Refrigerator – Earned by completing Boo's Haunted Bash with Mario. Mario's Sofa – Earned by completing Toad's Midway Madness with Mario. Mario's Table – Earned by completing Shy Guy's Jungle Jam with Mario. Mario's Television – Earned by completing Goomba's Greedy Gala with Mario. Bowser's Vase – Earned by completing Bowser's Gnarly Party with Mario. Luigi's Doll: This is a Luigi doll. He's the world's most unlikely hero, and Mario knows it! Luigi's Chair: This is Luigi's chair. It's not very comfortable, but it sure looks neat! Luigi's Table: This is Luigi's table. It's fashionable, but not very functional. Like Luigi! Luigi's Dumbbell: This is Luigi's dumbbell. Luigi can't actually lift it. It's just for show. Luigi's Airbike: This is Luigi's airbike. It shows you how many calories he's burned--zero! Bowser's Television: This is a Bowser television. It only shows infomercials. Evil! Peach's Doll: This is a Peach doll. It looks just like our lovely, danger-prone heroine. Peach's Treasure Chest: This is Peach's treasure chest. It's where she keeps all of her coins. Peach's Chair: This is Peach's chair. It is gorgeous and refined, just like Peach. Peach's Clock: This is Peach's clock. It was bought the day Peach was born. Bowser's Picture: This is a picture of Bowser. Koopa Kid made her hang it up. Ugh! Yoshi's Doll: This is a Yoshi doll. Isn't he just the cutest hero ever? Well? Isn't he!? Yoshi's Shoes: Those are Yoshi's shoes. It looks like they were just polished. Shiny! 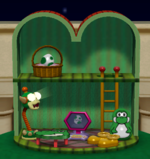 Yoshi's Egg: This is Yoshi's egg. It looks like it's about to hatch! But what's inside? Yoshi's Table: This is Yoshi's table. It's mostly used for serving fresh fruit. Yoshi's Computer: This is Yoshi's computer. It looks goofy, but it's really top of the line! Bowser's Lamp: This is a Bowser lamp. It shines with an eerily sinister light... So hypnotic! Wario's Doll: This is a Wario doll. He might be a little too disgusting to be a hero. Wario's Burger: This is Wario's hamburger. Wario can polish it off in one bite. Wario's Motorbike: This is Wario's motorbike. He lost his license, so he's not going anywhere. Wario's Recliner: This is Wario's recliner. It's got a vicious massage function. Wario's Chest: This is Wario's chest. Sure, it looks flashy, but it's totally empty. Bowser's Clock: This is a Bowser clock. It's always thirteen minutes slow. Freakish! Donkey Kong's Doll: This is a Donkey Kong doll. He's our hero from the jungle. Donkey Kong's Box: This is Donkey Kong's box. It contains Donkey Kong's treasures. Donkey Kong's Stand: This is Donkey Kong's stand. It can hold up to five bananas. Donkey Kong's Tree: This is Donkey Kong's tree. He takes good care of it. Bowser's Object: This is Bowser's object. It's quite, um, eye-catching...but what is it? Daisy's Doll: This is a Daisy doll. She's our fresh-faced heroine. Daisy's Side Table: This is Daisy's side table. Don't peek in her journal! She won't like it. Daisy's Bed: This is Daisy's bed. It looks hard, but it's really good for the spine. Daisy's Table: This is Daisy's table. I think Goomba made it for her. Daisy's Flowers: These are Daisy's flowers. She picks them herself. Bowser's Teapot: This is Bowser's teapot. It bubbles like magma. Waluigi's Doll: This is a Waluigi doll. It looks like it's plotting an evil new scheme! Waluigi's Chair: This is Waluigi's chair. It's simple, functional and tricky! 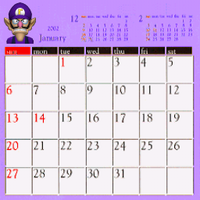 Waluigi's Calendar: This is Waluigi's calendar. Every day is Sunday?! Waluigi's Shelf: This is Waluigi's shelf. It seems to be in good repair. Waluigi's Shower: This is Waluigi's shower. It has good pressure...and spits flame!! Bowser's Bath: This is a Bowser bath. The water is always 1,000 degrees! Koopa Plate – Earned by reaching the goal within 45 seconds in Right Oar Left? 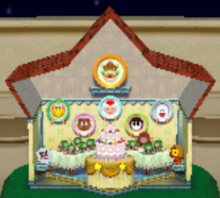 If the player manages to acquire all items for each respective area of the Present Room, then the Party Star Trophy will be obtained. Peach (right) is startled after encountering what just happened after the lights went out as well as noticing a bright light beam immediately appearing between her and Toad. That bright light is one of the Stars, and it reveals a constellation to complete the respective character's part of the Present Room. In this case, this is the constellation for Peach's area of the said room. When the player has prevailed in acquiring all the presents for a certain character in Mario Party 4's Story Mode, Toad appears to make an announcement toward them that there's one final surprise waiting to be revealed. However, this wasn't anything ordinary -- the revelation process required the lights to be turned out -- followed by a beam of light that just appeared from above shining between Toad and the character which the player used to complete their respective Story Mode process. That beam of light which Toad points upwards to is actually one of the Stars which the player has acquired throughout their entire process. The same star proceeds to reveal the said final surprise -- which is a constellation resembling the said character the player was using to officially complete their respective area of the Present Room. When the player visits the Present Room itself afterwards, they can view that character's said constellation that was just revealed by tilting Up on the Nintendo Gamecube controller's Control Stick while viewing the character's completed area of the Present Room. According to the in-game description, every day in Waluigi's calendar is Sunday. This is not true as the calendar displays other days of the week (of January 2002) as well as Sunday, very much like a normal calendar. If the camera is hacked for free viewing, it is possible to see that Daisy's journal is in fact the Japanese box art for Mario Party 2. This page was last edited on February 11, 2019, at 12:52.